It is important to you as a small business owner because it gives you insight into what is working and where marketing trends are heading. With the increasing use of the internet and businesses competing in the global marketplace, many businesses are replacing traditional marketing with inbound marketing. The common consensus is that to reach the global marketplace focus on using inbound marketing tactics and to pull prospects with content that is relevant to them. How can Inbound and Content Marketing Help your Business? What are the Different Types of Content Available for use by Your Business? Blogs – Educate, entertain and inform readers about your topics, encourage return visits to your blogs with frequent updating, engages readers to share comments and share the information with others. Social Media – Twitter, Facebook, Google+, LinkedIn and other social media sites help promote your business, showcase talents, engage prospects and help spread the word about your business. Presentations – Presentations provides readers with information that is appealing, informative, short and straight to the point. ENewsletters – Inform, educate and entertain readers on a consistent and timely basis, helps promote your business, are shared with others, increases reputation, recognition, trust and loyalty among readers, and increases sales. White Papers – Showcases your industry knowledge, provides the opportunity to be a thought leader, informs and educates the readers and can be shared with others. Articles – Educate, entertain and inform readers about your topics, showcase your knowledge and lead readers to action. Case Studies – Educates readers on your businesses pass success and tell how your business will help them achieve the same success. Video – Educate, entertain, informs watchers, helps increase your likeability, trust, recognition and reputation among watchers. eBooks – Establishes you and your business as experts in your industry, increases reputation, recognition and draws traffic to your website or blog. Podcasts – Educates listeners, helps increase your likeability, trust and reputation. Online Courses – Educate participants, showcases your knowledge, increases reputation and sales. Workbooks – Educates readers, helps readers solve problems, increases reputation, trust and loyalty from readers. Seminars – Webinars and teleseminars help educate participants, showcase your knowledge, increase reputation and recognition. 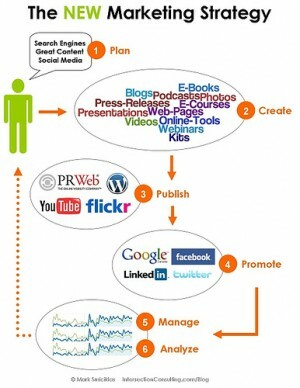 Businesses use a combination of the above inbound and content marketing tactics to create a online marketing strategy. While this is list is not comprehensive it is a good starting point to begin thinking about using content marketing in your business and what tactics are available. Inbound and content marketing allows small businesses and solopreneurs to level the playing field when competing against larger businesses. How are you currently using inbound marketing and content to draw prospects to your business?